With the help of our senior analysts, we’ve selected a trade for all 32 NFL teams that we’d like to see executed before the Week 6 trade deadline. Buffalo needs help in a handful of areas, and they especially lack both depth and talent along the offensive line. Spriggs, a former second-round pick who has been relegated to the bench in Green Bay, has NFL experience at both guard and tackle and would provide Buffalo with some depth and flexibility that they could very much use at a relatively low cost. The Dolphins’ secondary was considered an up-and-coming unit coming into the 2018 season, but injuries to safety Reshad Jones and cornerback Bobby McCain have tested the team’s defensive back depth. 2017 third-round pick Cordrea Tankersley has yet to play a snap this season after earning 637 snaps as a rookie. Eli Apple to the Dolphins was a popular mock-draft pick in 2016 and would immediately fill the void left by McCain at boundary corner. Apple has battled a groin injury and missed time but appears good to go for Week 5. When he has been on the field this season, he has played well, allowing just two receptions for 15 yards on seven targets over his 97 snaps. The former first-round pick has been relegated to the bench, logging just 30 snaps so far this season. Belichick loves collecting former 1st-round picks, and Reddick would bring youth and athleticism to a banged-up linebacking corps that recently lost linebacker Ja’Whaun Bentley to a season-ending injury. The Jets have not gotten much production from their edge defenders with a pass-rush win percentage of just 18.1, ranking T-29th in the NFL. Spence has been a healthy scratch as of late for Tampa Bay, not playing since Week 1, and perhaps a change of scenery would benefit the former second-round pick. The 2015 third-round draft pick has mainly played right guard throughout his career so far, but he has had multiple starts at left guard in his career, too, and graded solidly when he’s been there. Left guard is one of the weaker spots on the Ravens’ offensive line, with Alex Lewis producing a PFF grade of just 48.8 so far this season, and with Brown being kept out of the starting lineup by the impressive play of Austin Blythe, this is a trade that makes sense all around. While the Bills need all the help they can get protecting Josh Allen at the moment; they are also in the midst of an obvious rebuild. Ducasse is a competent pass protector at guard, which is still a massive upgrade from what the Bengals have had on the right side. Apple is currently battling through injury and hasn’t played since Week 2, but his time in New York has had its shares of ups and downs, both on the field and in the locker room. New head coach Pat Shurmur gave Apple a clean slate when he arrived, but Apple still might have a rotten taste in his mouth over how his time in the Big Apple has been. Cleveland needs a cornerback opposite of rookie Denzel Ward after Terrance Mitchell broke his forearm/wrist in this past Sunday in Oakland. Apple’s ability would fit well in Gregg Williams’ exotic scheme. After the Broncos drafted Bradley Chubb, Barrett fell to fourth on their outside linebacker depth chart, and his playing time has decreased to less than 30 percent of the Broncos’ defensive snaps. T.J. Watt and Bud Dupree currently have the most and second-most snaps, respectively, for 3-4 outside linebackers, and they could use a third to form a rotation. Cincinnati has committed to Bobby Hart as their right tackle through the first four games, leaving former second-round pick Jake Fisher on the bench. Fisher hasn’t wowed in his limited regular season experience, but it can’t get much worse for Houston at the tackle position. The Texans are on pace to allow a record-high amount of pressures this season if they can’t sew up loose ends along the offensive line. Denico Autry and Jabaal Sheard have played well for the Colts through Week 4, but the depth behind the two is lackluster, to say the least. Barrett, who has earned a respectable 71.6 overall grade through four weeks, is losing snaps to rookie Bradley Chubb. There’s no better time to shoot over a trade offer than now if the Colts want to upgrade along the edge of their defense. Tate is a free agent at the end of the season, and the Lions may be out of contention shortly. He brings another after-the-catch threat to the Jaguars’ offense that has relied on underneath throws in order to get the most out of quarterback Blake Bortles. The Titans are very thin at the receiver position, so this would be a low-risk, high-reward trade. Parker has all the intangibles to be a stud receiver but can not seem to stay healthy. A fresh start could be good for the young player, and he would be an immediate upgrade over Tajae Sharpe, Nick Williams, and Darius Jennings. Ravens’ C.J. Mosley has battled injuries to start this season, and even when he is healthy, Baltimore’s backup linebackers, Kenny Young and Patrick Onwuasor, haven’t let the defense down enough to keep Mosley off the trade block. Baltimore can invest in the future and move on from the oft-injured Mosley if they elect to send him off to a Broncos team in need of improving play at the linebacker position. Denver starters, Todd Davis and Brandon Marshall, have both earned sub-60.0 overall grades to start the 2018 season. Jenkins is a bit old (29), has two years left on his deal, but likely is a luxury a rebuilding Giants team cannot afford moving forward. The Chiefs are currently playing three slot cornerbacks and could really benefit from having a player of Jenkins’ caliber on their struggling defense. Though he’s become a face of the franchise, Long isn’t a long-term solution for the Eagles’ defense, nor is he the better option compared to Brandon Graham, Michael Bennett, and Derek Barnett. Philadelphia can win big by trading away their rotational edge-rusher to the Los Angeles Chargers as they patiently await the return star edge defender Joey Bosa. The Raiders’ woes at right tackle are well-documented. Donald Penn and T.J. Clemmings have allowed 10 combined pressures in three games, and signs aren’t pointing in a positive turnaround for either of the two veteran tackles. The Cowboys signed former New England Patriots offensive tackle Cameron Fleming to a one-year, $2.5 million deal this offseason to back up their starters at tackle, Tyron Smith and La’el Collins. With Fleming riding the pine on an inexpensive contract, Oakland can dramatically improve its current situation at right tackle by trading for Fleming. The 26-year-old tackle allowed just 16 pressures across 305 pass-block snaps a year ago. It’s no secret the Cowboys are in desperate need of playmakers at wide receiver. Garcon’s strengths lie in between the numbers at the intermediate level of the field, which matches up well with Dak Prescott. The Giants obviously need offensive line help where it is scarce in the NFL, but if the team is looking to the future, this could be a perfect opportunity to buy the best middle fielder in the NFL. James Bettcher’s scheme utilizes a 1-high safety in Cover 1 and Cover 3 more than any other coverage (31% and 22% used, respectively in 2018). Andrew Adams might have been the answer, but he’s no longer on the team. Curtis Riley ranks 82nd of 89 safeties in overall grade with a tackling grade of 41.5 (6 Missed tackles ranks T-4th most). Earl Thomas wants out – would there be a better safety tandem than Thomas and Landon Collins in the NFL? New York can avoid the offseason bidding war with an in-season trade for Thomas. Le’Veon Bell is the obvious link, but the chances of the Eagles paying him a contract rich enough to make him anything more than a rental are slim to none. Still, the team is in desperate for help in the backfield, with three quarters of the rotation already banged up. Darren Sproles might be done after his latest injury, or the offensive coaches could limit his touches to the return game and maximize his production. Corey Clement is also out, and Jay Ajayi is playing through a broken bone in his back that is obviously limiting his effectiveness. The only healthy back, Wendell Smallwood, lacks the vision, balance and pass protecting awareness to thrive in Doug Pederson’s offense. 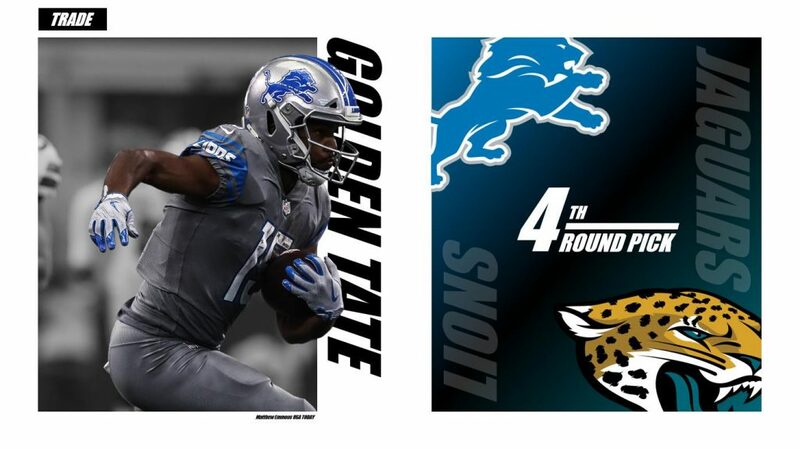 Abdullah would come cheap – he’s barely seen the field behind LeGarrette Blount, Kerryon Johnson, and Theo Riddick – and would instantly provide some sorely needed depth. 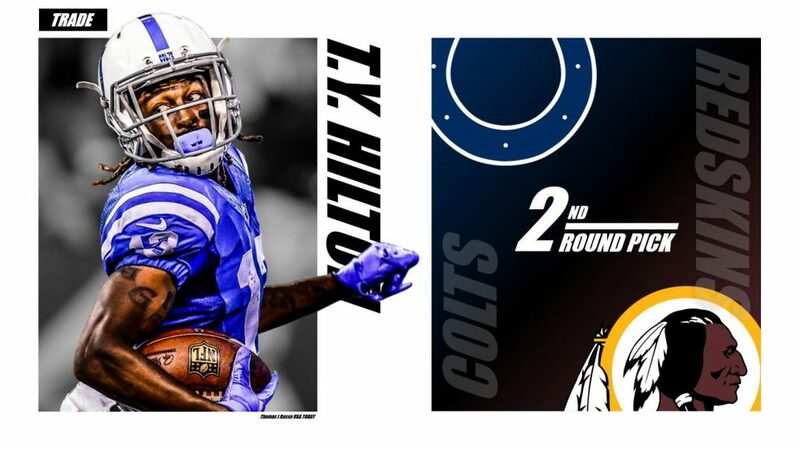 A year ago, the Colts seemed more than open to the possibility of dealing their star wide receiver, so long as the price was right. Hilton would give the Redskins a much-needed injection of talent at the receiver position and a presence on the outside that they’ve been missing since the departures of Pierre Garcon and DeSean Jackson. One of the best deep threats in the game, Hilton would almost certainly be an upgrade to a receiving corps that has combined for only 258 deep receiving yards so far this year, the worst mark among offenses. Jackson has yet to reproduce his outstanding 2015 season (82.2 overall grade), but he’s proven that his floor is still above average when compared to NFL guard play. He’s a strong pass protector that can also be a bully in the right run scheme. Bears’ Eric Kush simply isn’t cutting it, so it’s time to make an upgrade to help protect Mitchell Trubisky and get the ground game some more push up front. It’s no secret the Lions have had virtually no edge presence on passing downs this year, as no edge player with at least 20 snaps has an above average pass-rush grade this year. 2017 second-round pick Teez Tabor has logged just 56 total snaps this season, despite hopes he’d take over the No. 2 cornerback position for Detroit, and Hendrickson was actually a healthy scratch for the Saints against the Giants this past Sunday. Both teams have dire needs at the positions they’d be trading for, and a change of scenery could serve both players well. The Packers need help rushing the passer, and not too many teams are willing to part ways with edge talent. The Jaguars may be one, though, as Fowler is clearly the odd man out in the rotation with only 62 snaps on the season. So far, he’s having his best year as a pass-rusher, and there is no way Jacksonville can re-sign him after this year with their cap situation. You can never have too many pass rushers, and the Vikings defense has dropped off this season in terms of pressure. They have just the 12th-best PFF pass rush grade as a defense and the 10th-best win percentage. Tim Williams was a pass-rushing force in college, and while he has taken time to adjust to the NFL, he has flashed ability as a pass rushing specialist with six total pressures from 53 rushes this season. He could be a useful rotational body for the Vikings on the edge to try and help out a secondary that is beginning to be exposed. It appears the Jags and Fowler could be heading for splitsville at the end of the season, and with Atlanta possibly on a similar course with Vic Beasley, they could move to upgrade their pass-rush for this season and next by reuniting Fowler with his former college defensive coordinator. The Panthers’ top-three cornerbacks have all produced PFF grades of 62.5 or lower, and in a division that includes the caliber of wide receivers that the Falcons, Saints, and Buccaneers have, strengthening the position makes sense. Carr has been the Ravens’ highest-graded cornerback at 72.5 so far this season, but with Jimmy Smith returning, 2017 first-round draft pick Marlon Humphrey performing well and Tavon Young better suited to the slot than Carr, he is somewhat expendable for the Ravens right now. The Saints’ cornerback room has been a dumpster fire all season. At his best, Claiborne is a solid man-corner who’s only allowed eight catches in coverage all season. He’s 29 and will be a free agent after the year, so the Jets could be willing to part ways. 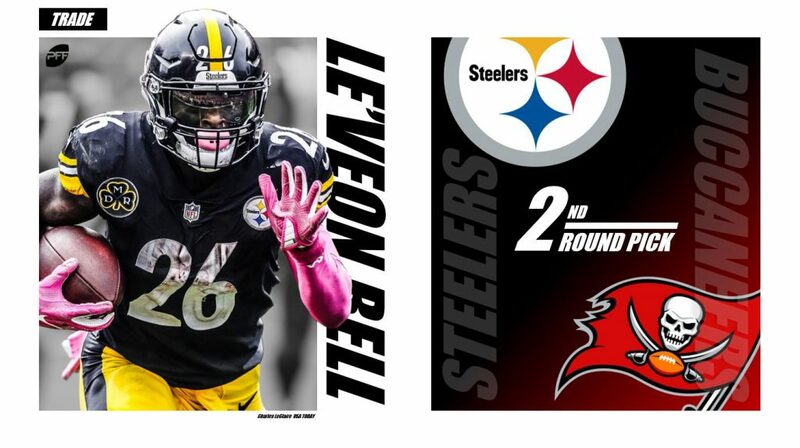 Bell is out of Pittsburgh no matter what at the end of the year and a second-round pick is what they essentially gave up in selecting both Roberto Aguayo and Ronald Jones (who hadn’t seen the field until Week 4 in 2018). Getting Bell even for a half a season at that price is worth it, given the track record of ‘second-round selections’ from Tampa of late. Needing offensive line help in today’s NFL is not a happy place to be, but there are a few low-risk gambles worth taking for a team as desperate as Arizona. Seattle doesn’t seem like an obvious place to search for OL reinforcements, but they do seem to have been able to collect average centers, and the odd-man out is Joey Hunt, their sixth-round pick from 2016. Hunt has only played 147 regular season snaps in his career, but he has been average at worst when he has been out there, and for the Cardinals that would represent a massive upgrade over their current starter, rookie Mason Cole. If there’s a weakness on the Rams’ defense, it’s on the edge. Ansah brings a productive player who can compress the edge while Aaron Donald and Ndamukong Suh dominate in the middle. The 49ers can’t afford to spend big on a one-year rental under center, but trotting out second-year quarterback C.J. Beathard for the next 12 weeks may keep the seats from filling up at Levi Stadium. 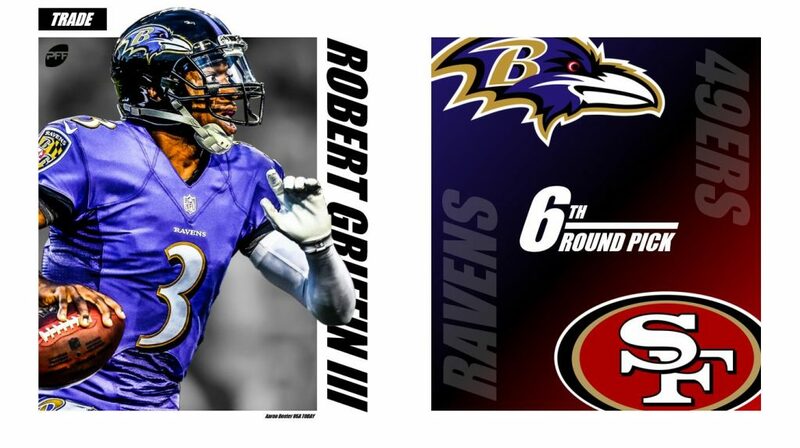 Starting Beathard to see a handful of respectable losses isn’t as exciting as watching Robert Griffin III try to revitalize his career. Griffin can still add value, as he recorded the highest passer rating under pressure (149.5) among qualifying signal-callers in the preseason. Plus, San Francisco head coach Kyle Shanahan coached Griffin as the Washington Redskins offensive coordinator in his first two years in the league. The Saints have turned to Demario Davis, Alex Anzalone, and A.J. Klein over T’eo at linebacker despite T’eo’s success in 2017 and early in 2018. The Seahawks are in need of depth at the position given just how poorly Shaquem Griffin and Austin Calitro have fared in the absence of K.J. Wright. Mychal Kendricks is also now suspended indefinitely from the NFL, so more reason to pull the trigger on a trade for T’eo.